The year 1963 was a tumultuous year. It was the year that we lost our beloved President Kennedy. With vivid memory I recall landing that year with ten other Marines into Tan Son Nhut airport in Saigon. We would be soon heading north, just south of the DMZ (Demilitarized Zone), fifteen klicks (kilometers) below Hué. It was at the Citadel in that city where some 5 years later the infamous Têt Offensive by North Vietnamese forces would radically change the commitment of U.S. forces in battle, and in turn changed US policy, politics, and history. Army General William Westmoreland met us that day inside of a Quonset Hut and briefed my fellow Marines and me on conditions in the North. Westmoreland was eager in command, and this group of young men, averaging 19 years of age was also excited to be involved in this new adventure. As time would dictate however, the optimism of that day was sapped by a years-long bloody, messy, and ultimately failed engagement. History will be the final judge of why so many human sacrifices were unselfishly laid upon the table. 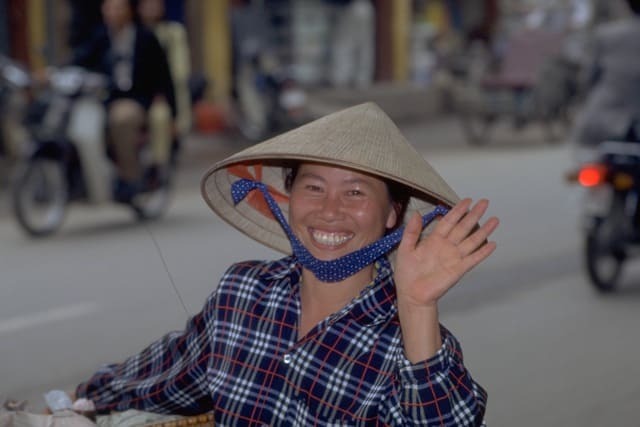 Having spent two separate tours of duty in Vietnam in the sixties, and aside from the military conflict, I was absolutely amazed by the culture and geography of the area. These wartime experiences instilled a passion for Asia within me that would remain deeply rooted. In 1994, when the State Department allowed travel to Vietnam, I was one of the very first on the tarmac set for my return. The day of my return I landed in Da Nang, where years before I had arrived via helicopter from Hué amidst scores of fighter aircraft actively using multiple runways. That day our propeller-driven craft was the one and only on the airfield and the stark contrast of my memory of the sixties with current reality was palpable. Economic sanctions during the war had devastated the country, and upon arrival in Saigon in 1994, one could count the number of motorized vehicles on one hand – the majority of which were military. In fact, bicycles and cyclos (a bicycled-pedaled cart) were used nearly exclusively by the populace throughout all of Saigon at the time. Today, with the onslaught of Japanese motorbikes, a self-pedaled bicycle would be a truly hard find at all within the city environs. Additional modern changes in Vietnam have also been astounding, from ubiquitous 5-star boutique hotels to a range of modern aircraft available to ferry travelers from city to city. The nation has truly become a traveler’s delight, and I have since returned on numerous occasions. The most remarkable aspect of my return is seeing the many spectacular places I had missed as a Marine on duty in a war-torn environment. My personal journeys have taken me to many, many wonderful locations. From the balmy waters of Ha Long Bay northeast of Hanoi with its towering monoliths to the backwater canals of the Mekong Delta, to all of the remarkably beautiful, at times historical sites in-between. Each and every return to this magnificent country provides a new adventure and certainly new friendships. If you have travel bucket list in mind, clearly Vietnam should be near the top.